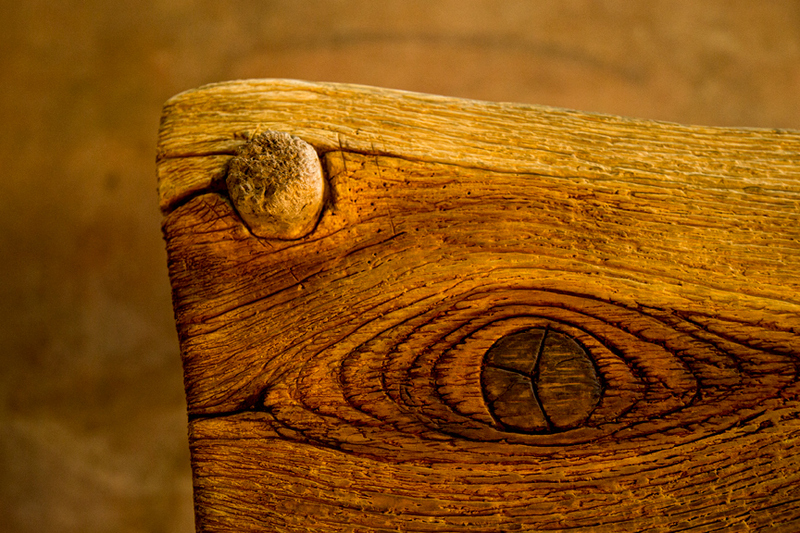 Marci Davis transforms rebar, steel and concrete into natural pieces of furniture that are more than meets the eye. It’s a bright, breezy day, but the chickens are nervous. A hawk’s screech is stressing them out, far more so than the blowtorch roar or cement mixer growl that usually booms from Marci Davis’ workshop. We drop everything to guide the hens to safety, and I can’t help but notice the metaphor. Whether we’re talking about her unique art medium, “Ferrocement Faux Bois” or her agitated poultry, Davis is singularly, fiercely focused on preserving nature’s beauty. Davis is a rocailleur, a sculptor who transforms rebar, steel lathe and concrete into objects that appear to be crafted from wood. 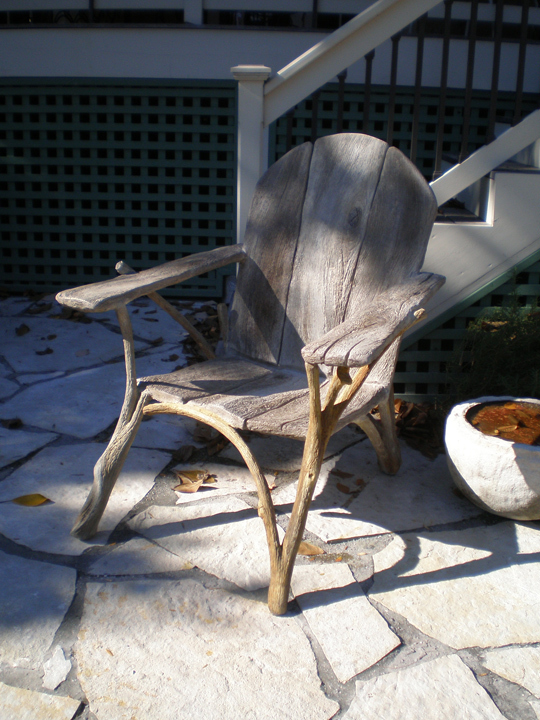 Her pieces are “functional outdoor sculptures,” like Adirondack chairs, tables and garden benches. If you see one in a garden, you’ll swear it’s made out of branches and lumber. Only the concrete’s telltale weight gives it away. Working with real timber certainly would be easier. 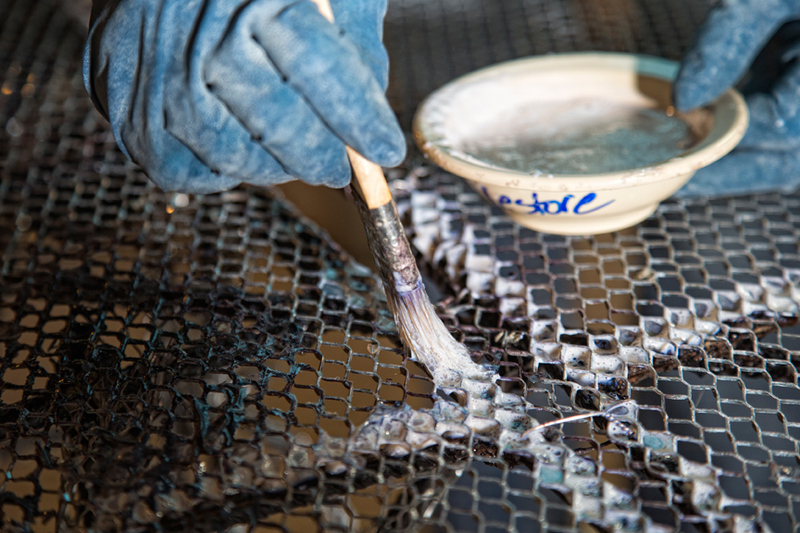 Each custom-designed piece takes a minimum of a month to complete. First, Davis creates a frame out of rust-inhibited rebar and wraps it with steel lathe. 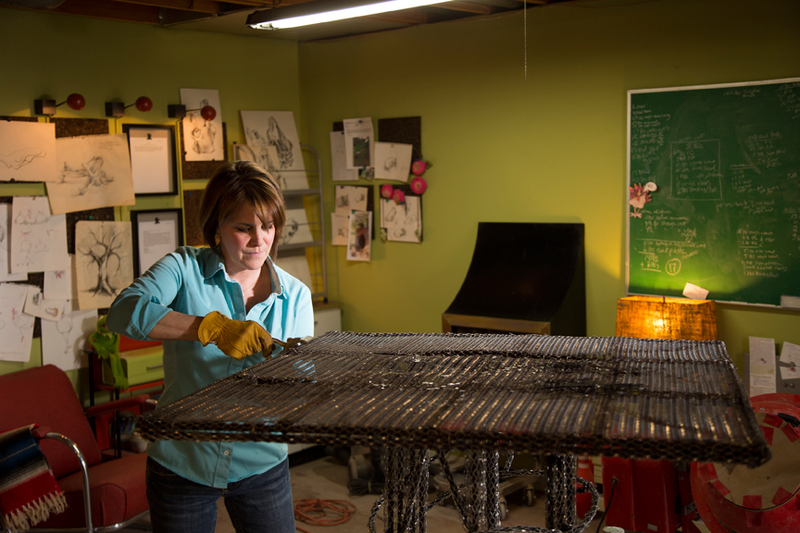 She uses safety twist pliers to clamp the mesh to the rebar. The pliers whirl wire easily, as if it were cotton candy, which just might be the coolest part of the whole process. Then Davis adds several layers of concrete to the steel frame. Each one is hand-mixed with varying amounts of fiber and ash, in order to make the concrete even stronger. 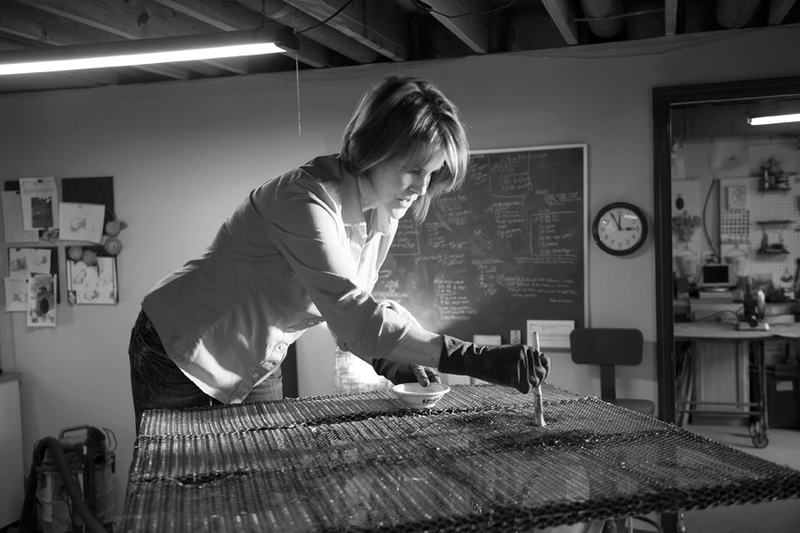 Lastly, she sculpts the final layer of concrete, giving it wood-like knots and a grain. 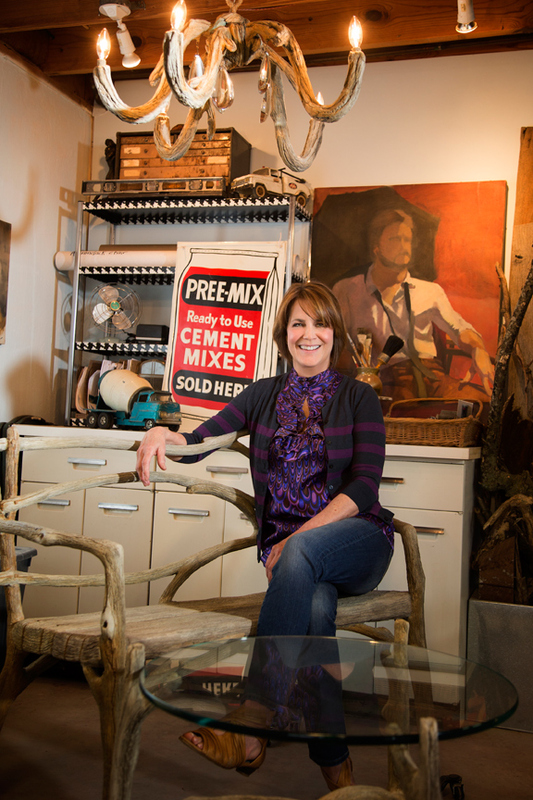 She makes her own sculpting tools, using everything from wood sticks to dog-grooming brushes. While it’s a labor of love, it is hard labor. A bag of cement alone weighs 94 pounds. And then there’s the heavy burden of time management. When Davis is working with the wet concrete, she only has a little time to sculpt before it becomes solid. If it’s a sculpting day, she is tied to the workshop for eight or more hours. “It’s an unrelenting medium, and it can be hard for people to understand that I can’t leave the workshop sometimes. I never could have done this when I had small children,” Davis says. You can see the bluebirds and examples of Marci Davis’ work on her website. Pieces are custom-made to order.